Close to 5 months ago, I published a blog post titled How I Gained 10,000 Real Twitter Followers. If you haven’t read it yet, I highly recommend you do, as I am not going to repeat what I already wrote there in this post. At the time I published that post, nearly 5 months ago, I had 10,383 Twitter followers. I now have 25,439. That means I gained around 15,000 new followers in the past 4.5 months, which is approximately 125 days. That works out to a daily average of just over 200 new followers per day! These are all real followers, most with many followers themselves (some with tens or hundreds of thousands), yet I am only following 12 people myself. Well you since you read my first post, you should already know that the answer is: Twiends. And since you have a good memory, you’ll remember that Twiends is a free service that allows Twitter users to list themselves in what is essentially a giant Twitter directory. But I don’t use Twiends the traditional way. That is, I don’t spend my day following others so that I can earn ‘seeds’, which is essentially advertising credit that I can use to gain more exposure to my profile. Instead, I simply purchase the seeds. 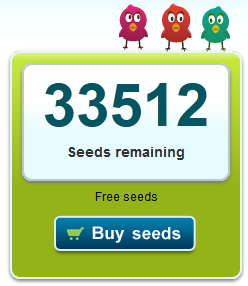 In fact, as I write this, I currently have 33,512 seeds in my Twiends account. I have my account set to give out 2 seeds whenever somebody follows me, so that means that my current number of seeds will effectively give me another 16,756 followers. However, the retention rate with my current targeting and settings (again, all mentioned in my original post) is roughly 50% (although I did not track this for a long time so it could be more or less now), so long-term you can expect that to be more like 8,378 followers. Since I am averaging around 200 new followers a day, that means my seeds will run out in approximately 42 days, at which point I’ll need to top up my account again. Twiends offers a cheaper per-seed cost the bigger the package you purchase, so what I do is buy the biggest package of seeds I possibly can. 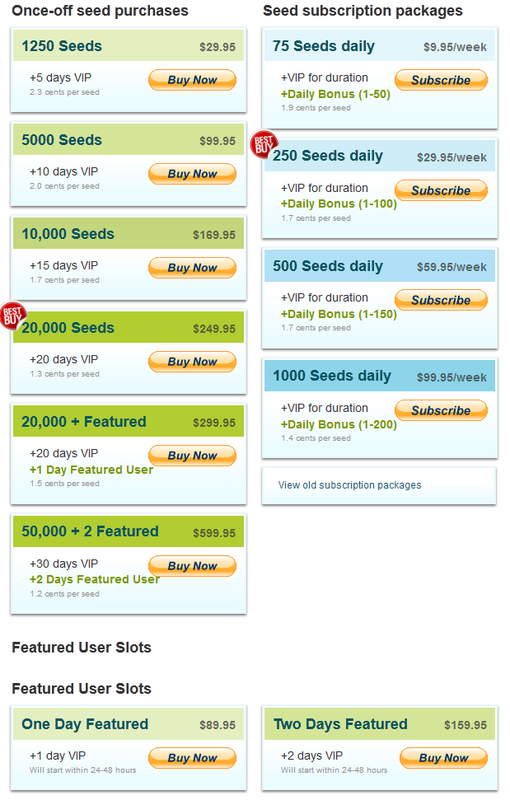 As you can see, you can purchase 1,250 seeds – their smallest "once-off" package – for $29.95. That works out to $0.023 per seed. However, you can see that their larger package, the $20,000 + Featured one, works out to only $0.015 per seed, and also includes a Featured User spot as well ($90 value). When you factor that in, it’s really only $0.01 per seed! That means that you can gain long-term new followers for approximately $0.04 per follower (assuming a 50% long-term retention rate). But once you make a purchase (I forget if you have to make a larger package purchase or just any purchase), new options open up to you, such as the 50,000 package which offers an even cheaper per-seed rate. All of those includes 30 days of VIP member plus 2 days of Featured User spots. When you factor that in, I’m actually getting my seeds at a rate of under $0.01! It’s because of this, coupled with the way I have my settings (explained in the next section), that I am able to get so many new followers at what is essentially a bargain. Since my first post, they raised their One Day Featured slot by $10, and added the Two Day Featured slot. The One Day Featured slot price has now been raised twice; it was originally only $59, but as demand for it grows (and the Twiends user base grows as well), so does the price. Actually, I warned you in my original post that prices may rise… and that warning still stands as Twiends continues to grow. I still recommend grabbing this slot if its your first time buying seeds/advertising on the site, as it will give you the best band for your buck. You can expect to receive 3,000 to 4,000 new followers within 48 hours! However, keep in mind that I’ve found the Featured User slot to have diminishing value. That is, the more times you purchase it, the less effective it becomes. It’s absolutely fantastic the first 2-3 times, but then quickly loses its power. I suggest grabbing the One or Two Day Featured slots, then follow up by purchasing a big batch of seeds. I wrote about this in my original post, but I have to reiterate it again as it is absolutely crucial. By default, these are set to the very highest which can lead to very high unfollow rates. If you want to have an even better retention rate you can adjust the knobs further to the left as desired, but keep in mind that you will gain new followers at a much slower rate. 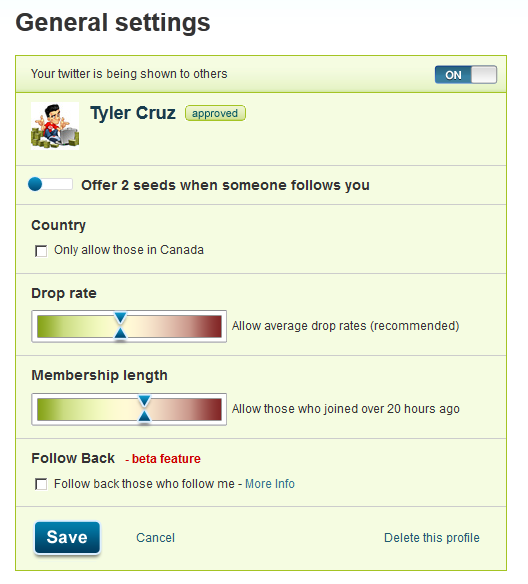 I personally offer 2 seeds because it’s the best value (the lowest you can go), and I’m happy with my new follower rate. It should be noted that Twiends does not sell, let alone guarantee, new followers. Instead, they sell seeds, which is a form of currency that is used to get your Twitter profile shown to other Twitter users, and award those users with seeds if they follow you. Basically, you are purchasing a form of advertising. At Twiends we don’t sell followers, we sell promotion, and we make no claim to automatically add followers to your profile. We’re simply a directory where people can find and check out others by interests and country. Please be very cautious of any other websites that try and sell you followers. So it is up to you to make sure your retention rate is good, and that you’re receiving new followers at a decent rate. You are purchasing seeds, not followers. That being said, the whole process is incredibly easy and once you’re set up and have seeds in your account, you really just sit back and watch the new followers come in. So You Have 25,000+ Followers – Now What? Some of your have left comments or tweets asking what the value is in having so many Twitter followers. I was going to address those questions and concerns in this post, but it has already become quite lengthy so I will include them in an upcoming post (either the next one or the one thereafter). In it I will include some Twiends tips, how I monetize my Twitter account, disclose the traffic received from Twitter, among other influences my gained Twitter followers have had. 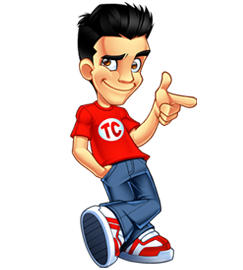 If you haven’t already, be sure to follow me on Twitter (@tylercruzdotcom) I’m actually quite active on Twitter these days, and usually share a lot of stuff that I don’t post on my blog. LOL. No wonder you have so much trouble making money online. Stop flushing money down the drain. Twiends looks like a really good website to get some good Twitter followers. While I see it has done really well for you , I don’t like that you have to purchase and give out seeds to get followers, I would rather just get them as they come or find me. I’ve used Twiends too now (mainly after your previous post). Twiends followers are not really useful followers, most people there are just there to gain follower count and don’t really read the tweets you send out. I think Twiends is good to grow a twitter account to a number that’s not so small anymore and make it more appealing for real people to follow you naturally. I also think having just slightly over 1000 tweets and over 25,000 followers is a sign of buying twitter followers to other people and it might deter them away. OK, this is lots of math you did in your article. Anyway, nice idea and nice technique. I believe once you have sufficient number of followers, just like in your case, you should stop using seeds to attract new followers instead let your current followers to give you new followers in more natural way, by finding you and by liking you. Such followers are the most loyal of all!! Anyway, nice article and thanks for sharing!! How long have you been in this industry and you still haven’t realized that buying twitter followers, facebook likes, cheap bulk traffic, etc. Doesn’t work? Your “real” followers are about as useless as bot accounts. Whats the point of having 25k followers when they don’t even read what you have to say? No wonder your other businesses fail. You still haven’t learned anything. It isn’t 2003 anymore. If you want to succeed in online business you have to provide real value. Which you still don’t understand seeing how you have like 7 whole posts for the year. Half of which were probably paid postings. Pretty damn nice 😀 I just bought the 75 daily seeds package. Thanks dude. How much has traffic increased to the various links you post on your Twitter? Are these followers actually reading your tweets and engaging with you? I’ll be talking all about that in my next post. It’s obviously nowhere near as good as if all the followers were completely natural, but I do see some engagement from them. Great, looking forward to that post. I paid for the smallest package awhile back and ended up with about 200 followers that have stuck around and I’ve seen a slight increase in engagement, but not a lot. Not sure if it was worth the $30 or whatever I paid. “all” “completely natural”? try any. this sounds like a terrible idea. Why do people buy twitter followers? It’s a huge waste of money, they’re all going to be bots or ego boasting blowhards with no interest in engagement or coversion to sales which is what I am interested in. So you buy a bunch of seeds and as an incentive to get followers you say “Please follow me, I’ll give you two seeds to be my friend” Pathetic! How on earth would this benefit anyone that isn’t interested in an inflated number of followers that does no good but to boost your own ego. The article did give a thought though. This is by no means a good way to get followers, however it might be beneficial to set up a website full of bots to follow twitter accounts by way of trading some false value in order to obtain those followers. That false value of course costs real hard cash. To bad Twiends has this model already in play and they appear to be successful if the OP is any indication of their target audience. BTW you’re not advertising. What you are doing is akin to going to Circle K or 7 11 with a mason jar full of change and walking in front of the hobos back and forth saying “I’ll give you change if you hand out my business card” Those bumbs are your target audience. No intention of buying anything from you but they want your change so they’ll jump through hoops. This does not encourage conversion to sales nor engagement, so why the hell would you want these people on your twitter account? Hey there Cruz thanks for this very interesting article ill be honest i didnt even know you could do this but thought there must be something out there that was gaining certain people so many followers now i know how they are doing it. bingo. the only reason to buy this stuff is for appearances. and the distinction between buying follows and buying some fictional currency that gets you more followers is meaningless. This is very new to me, these people are really good with coming out with such ideas to make $$! this headline is terrible. “real” followers? these don’t sound remotely real. sorry but converting money into credits and then using credits to get followers doesnt change the basic equation: you are buying followers. or do you think you’re not actually spending money at an arcade because they make you convert your quarters into tokens, too? no response on the fake twitter follower thing. has tyler ever answered any pointed question in here? i sure havent noticed if he has. I recently tried this out and it worked pretty well. I say these are all real followers because they do retweet your posts and they also interact with you quite nicely. Its new information for me, I am on twitter but using it traditionally, no idea about buying seeds. Good idea got thanks for post. Thanks for the tips for twitter followers. We just started our page and will use these tips. Hello Well, that’s very expensive. Nice Information in this article I have just started a twitter page I will use these tips. Thank you for your tips to increase twitter follower.